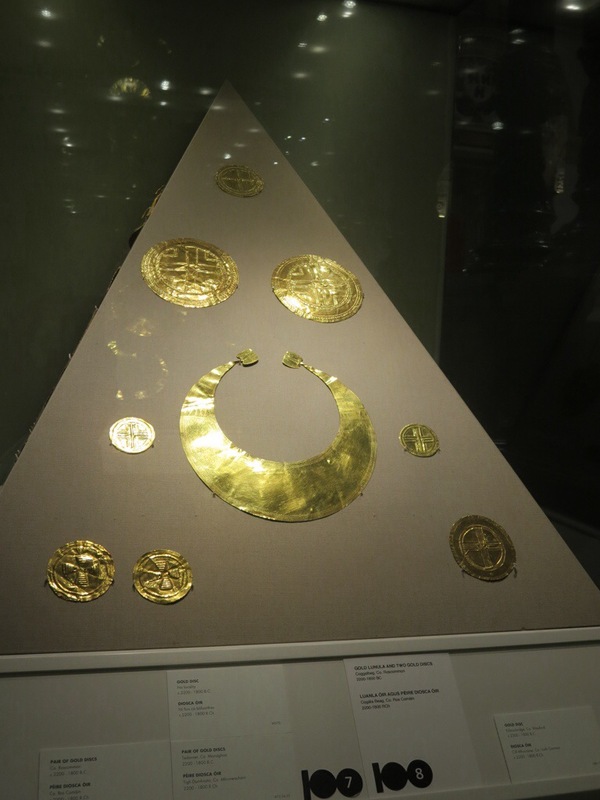 After visiting Trinity College, I went over to the National Museum of Archaeology. 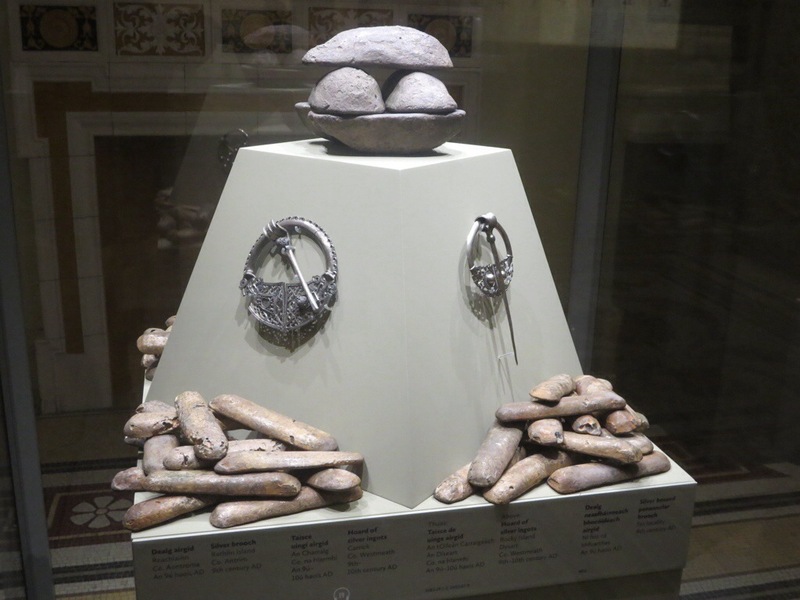 My main purpose of visiting was to see their impressive collection of jewelry that is thousands of years old, including many Celtic pieces like the famous Tara Brooch. 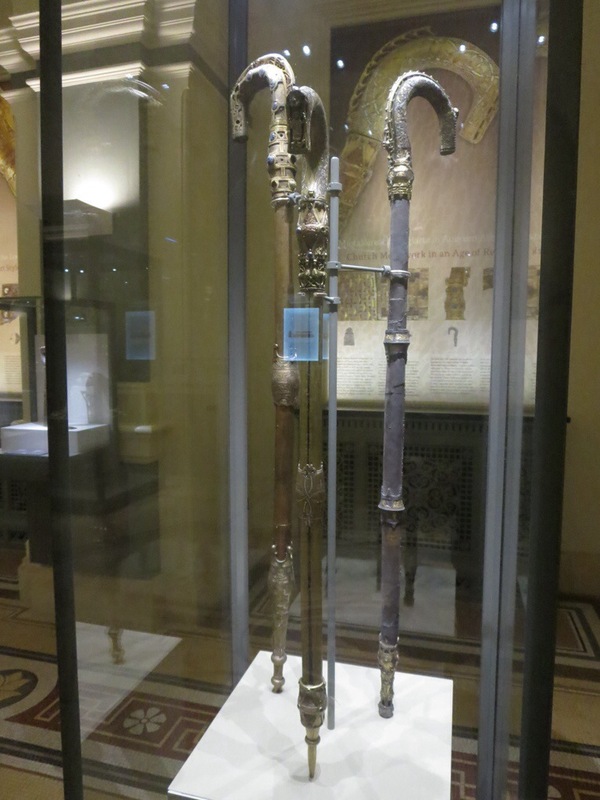 I was amazed at how well the objects had been preserved. 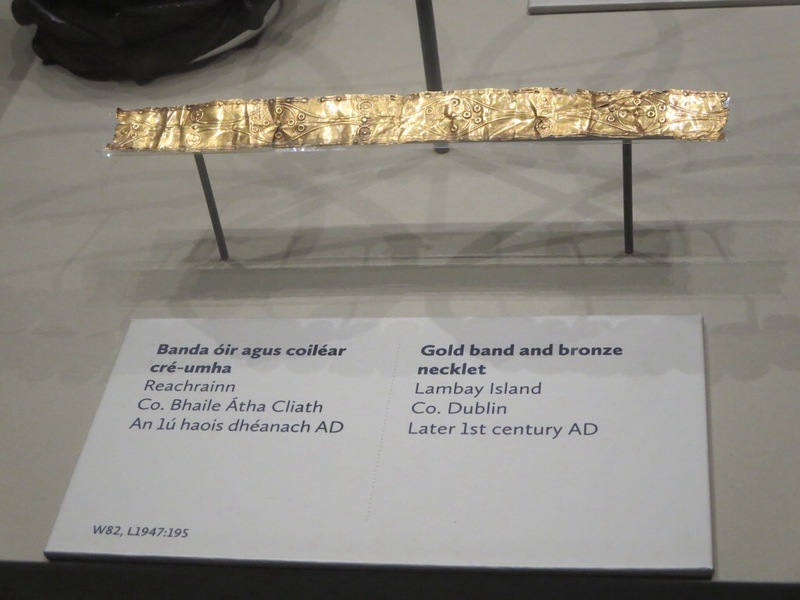 Apparently Ireland’s soggy marshes and bogs helped to preserve these objects. 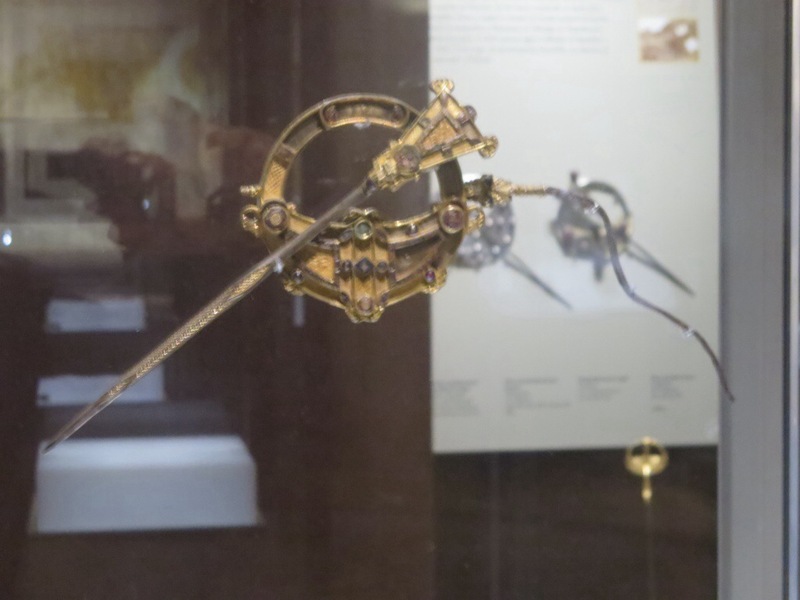 A couple of other highlights in addition to the Tara Brooch were the Cross of Cong (said to have once contained a splinter from the actual cross on which Jesus was crucified) and the Bell of St. Patrick. 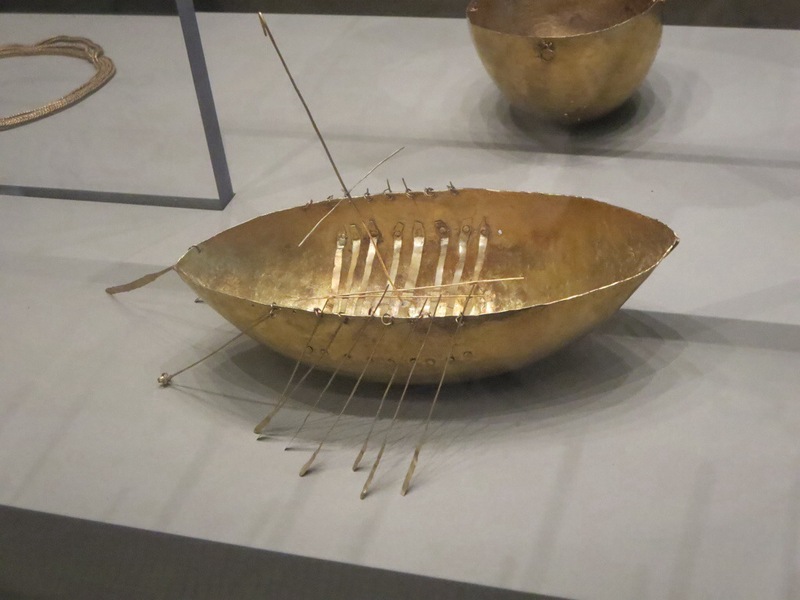 I also saw an impressive collection of gold jewelry dating back before 2,000 B.C. 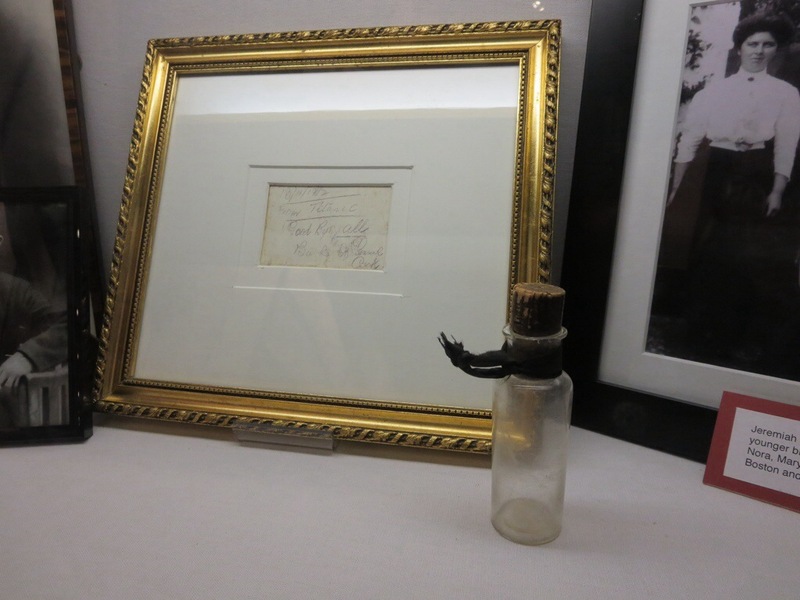 Another exhibit which was both astounding yet gruesome was a display of bodies that were discovered in the bogs of Ireland. 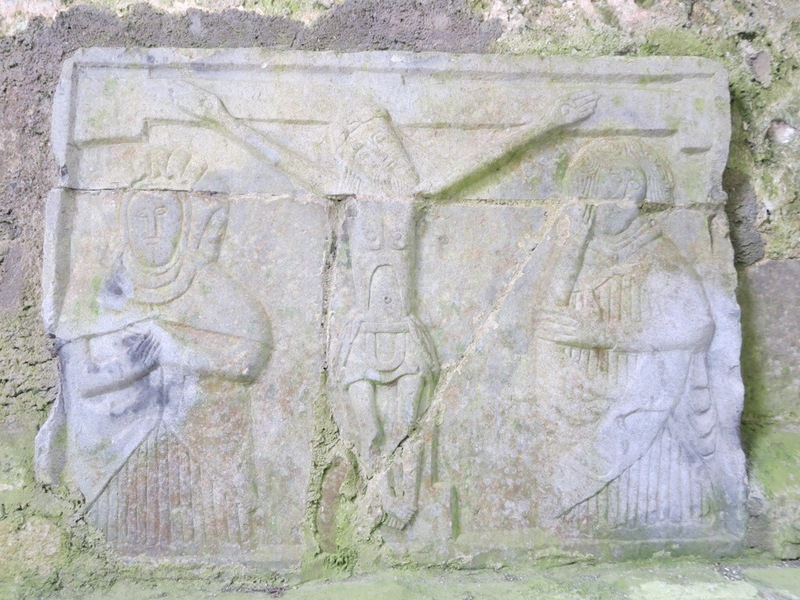 These bodies date back to Celtic times and are thought to be the result of the Celts’ practice of human sacrifice. 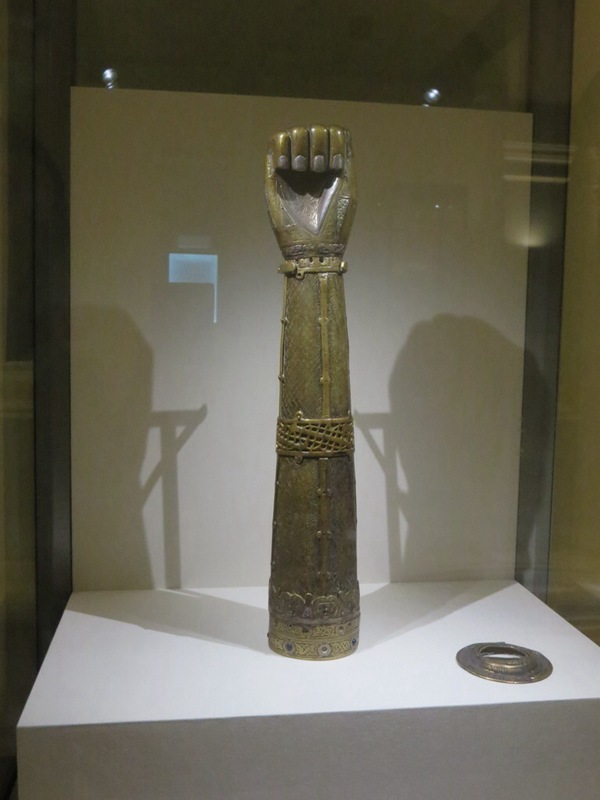 The museum closed before I could see all of the exhibits, but I saw everything that I was hoping to see. I had to head back to the hotel anyway, as our group was leaving soon from there for our farewell dinner. 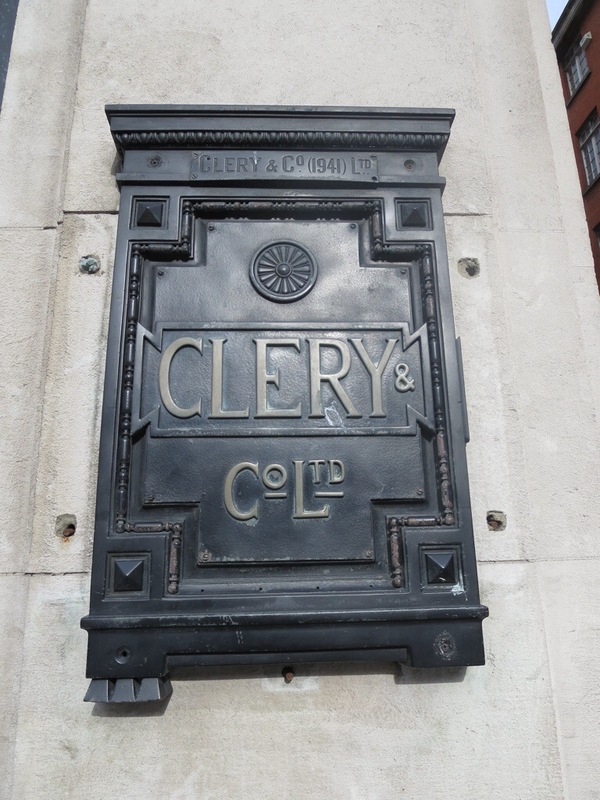 On the way back to the hotel, I stopped at Clerys, a department store that has been in business since 1853. 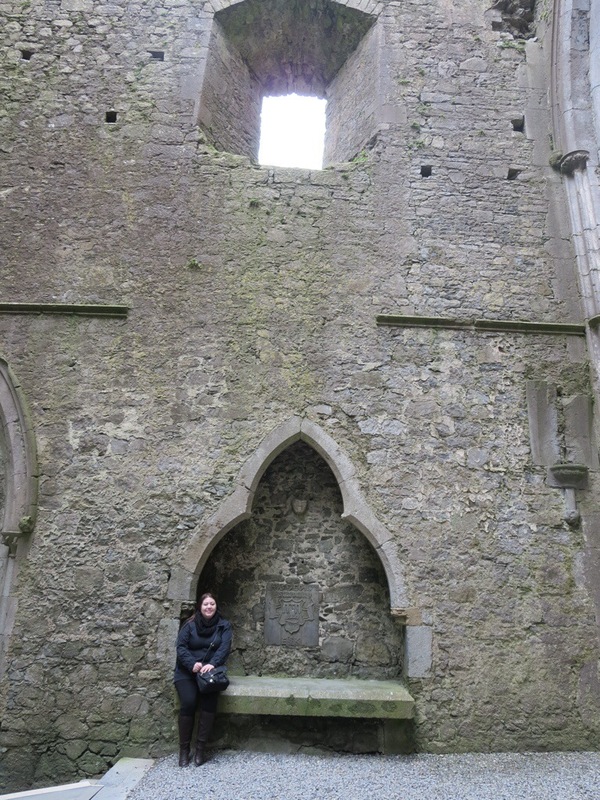 We had a few hours of free time in Dublin on Friday afternoon. 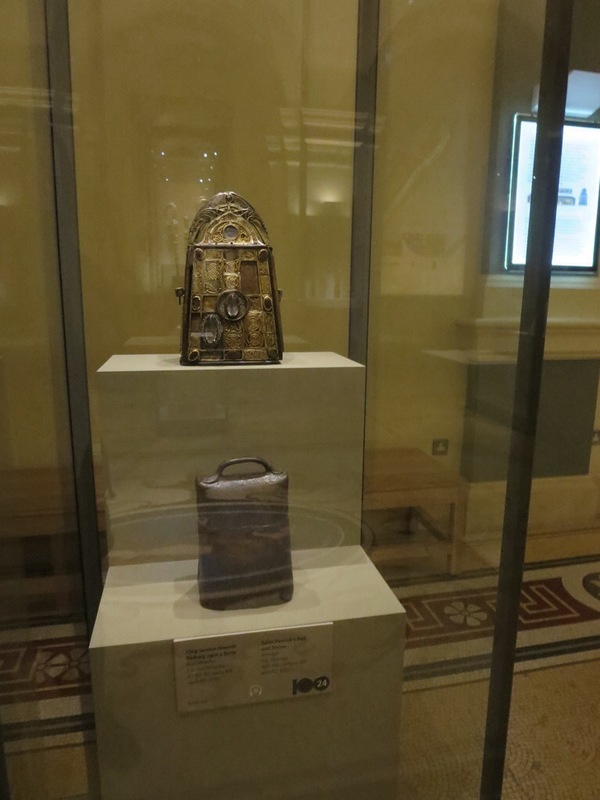 This was only enough time to visit a couple of places, so I decided to go to see the Book of Kells in the Trinity College library and then visit the National Archaeological Museum. 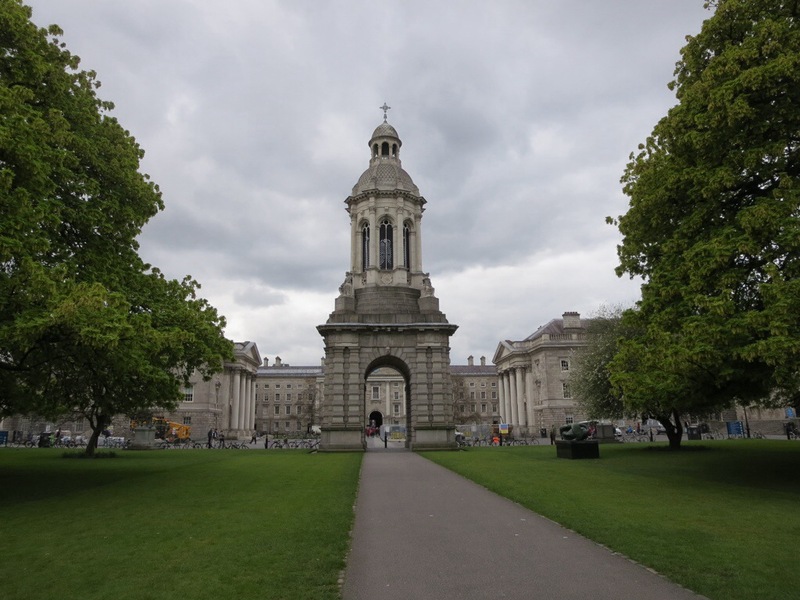 When I entered Trinity College, I saw that there was the opportunity to have a guided walking tour of the campus which included admission to the library for only one additional euro, so I decided to do the tour. Our guide was a student in his final year studying English. He was wearing what I can only describe as a cape-like vest over his clothes. He explained to us that this was the traditional academic dress for students and that it was required to be worn until 1972 when it became optional. It is rarely worn on campus nowadays, except for students like him who work for the university giving tours. He told us about how you can take an academic test to qualify for a full scholarship, but the number of students who pass is extremely low. The scholars eat dinner in a dining hall with the fellows. Apparently dinner is over for everyone as soon as the last fellow finishes dinner, so the scholars learn to eat quickly! 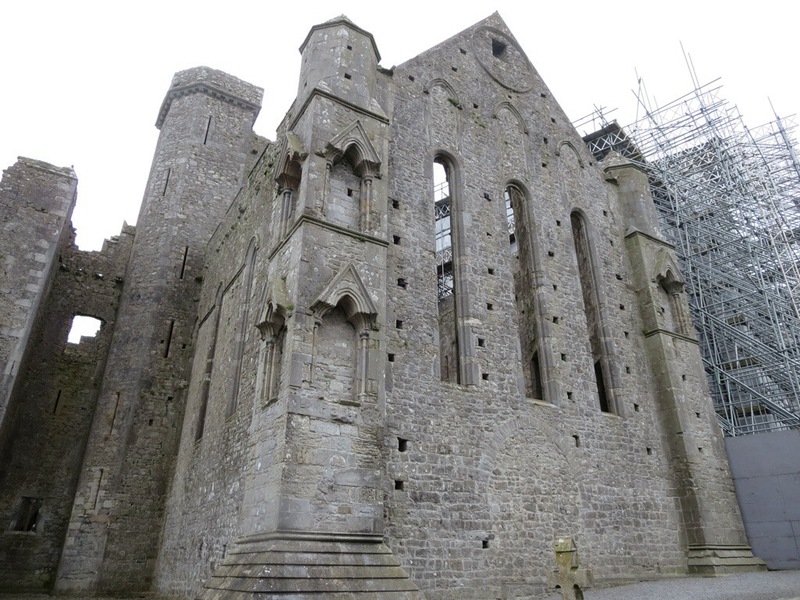 Our guide pointed out a building whose top half was made of a different stone material than its bottom. 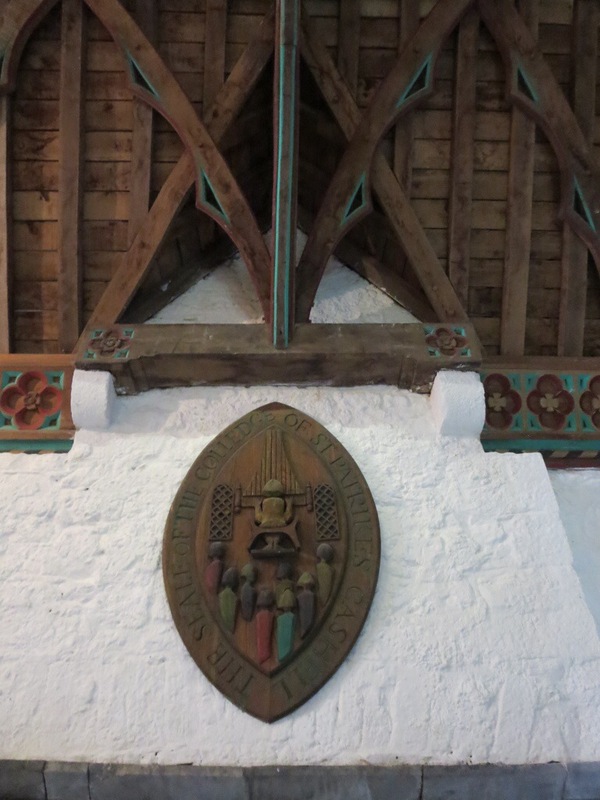 He said that the building was constructed altogether and that is was done on purpose, then asked us to guess why. No one could figure it out. 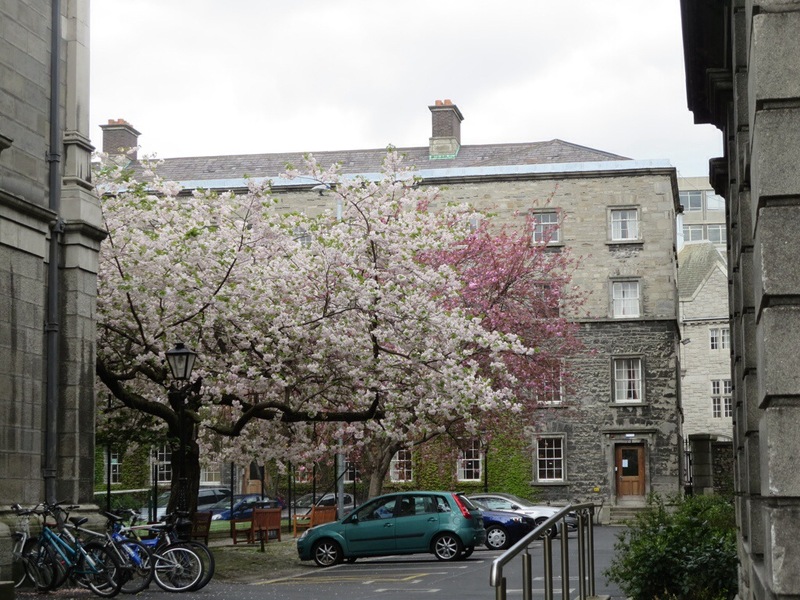 It turns out that there used to be a wall around the campus, so the builders used nice material for the top part which could be seen by the outside world over the wall and cheaper material for the part that could not be seen from outside the wall. We walked by a field where a field hockey game was in progress. 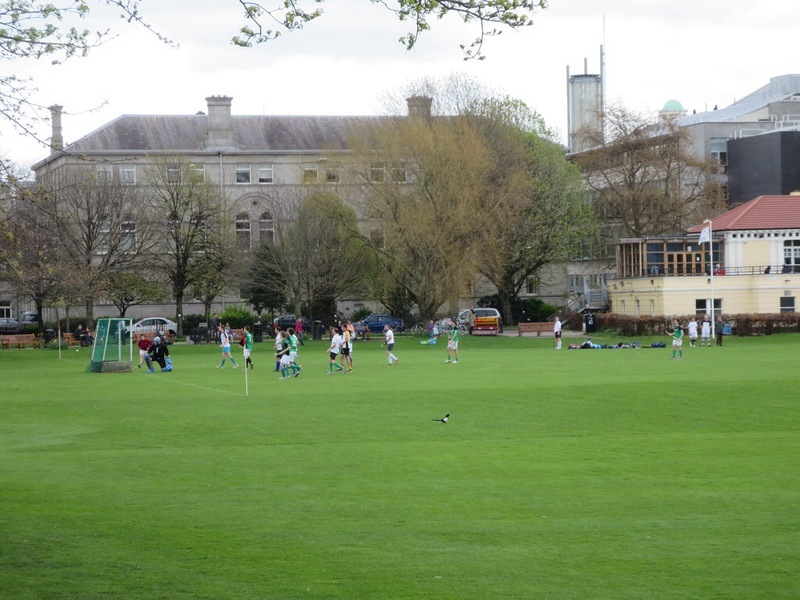 He half-jokingly referred to it as both “an inferior version of hurling” and “Protestant hurling”. 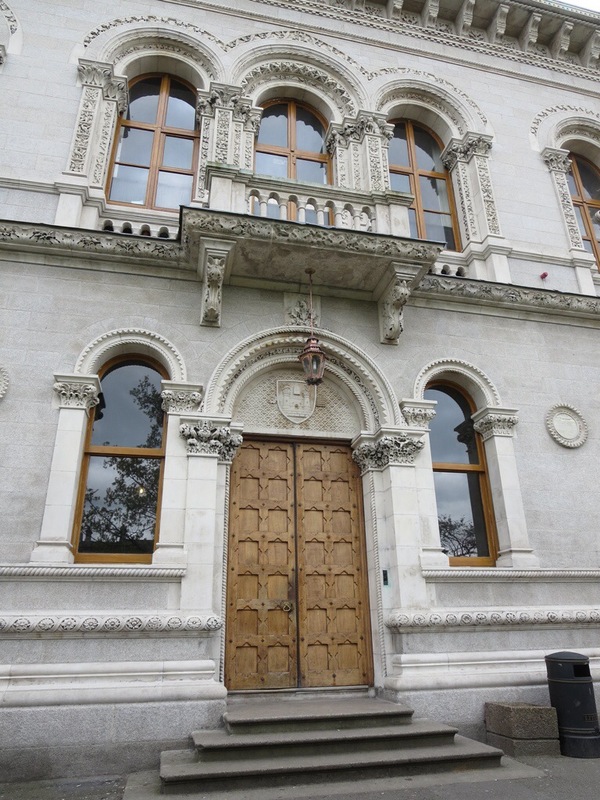 After the tour, we went to the library to see the Book of Kells, a 1,200-year-old version of the Bible. Its 680 pages combine Christian symbols with pagan styles and is considered to be one of the finest illuminated manuscripts in existence. 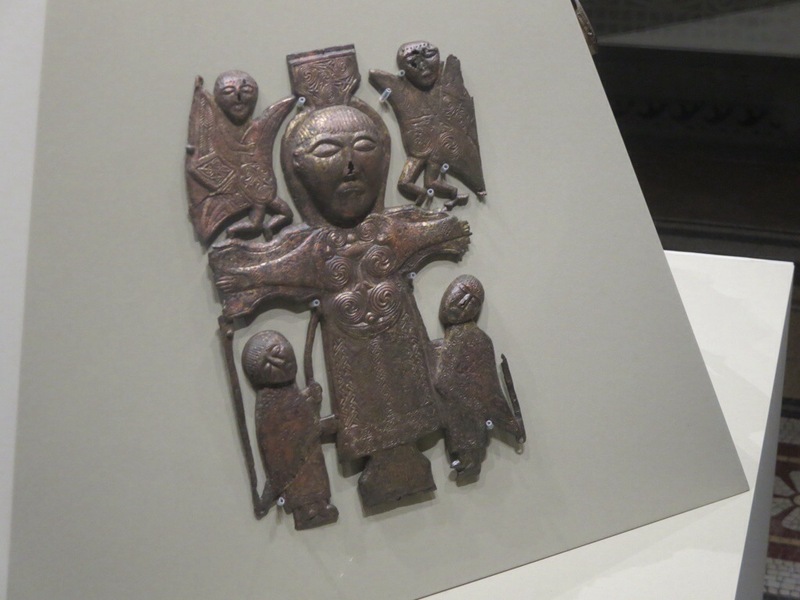 The book was created by Irish monks on the Scottish island of Iona. 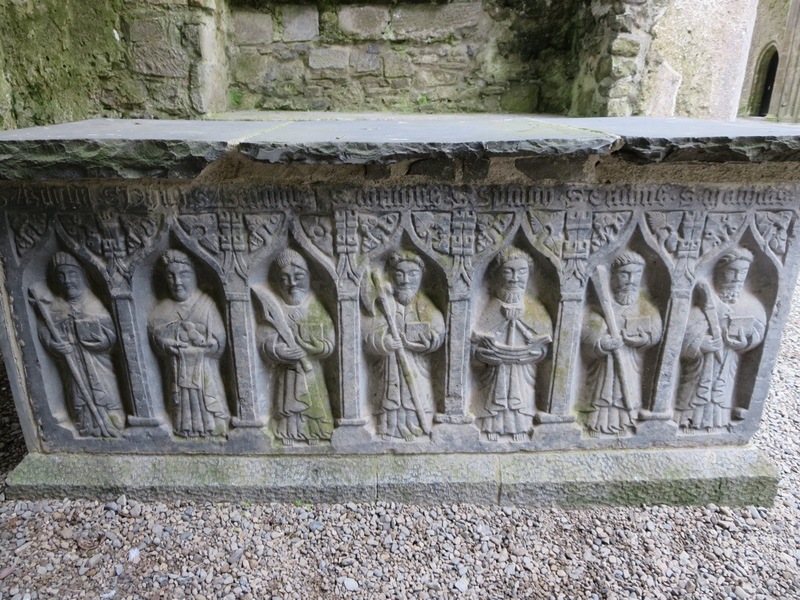 Vikings pillaged and burned Iona in the year 806, but some of the monks survived and fled to the Abbey of Kells near Dublin, taking the book with them. 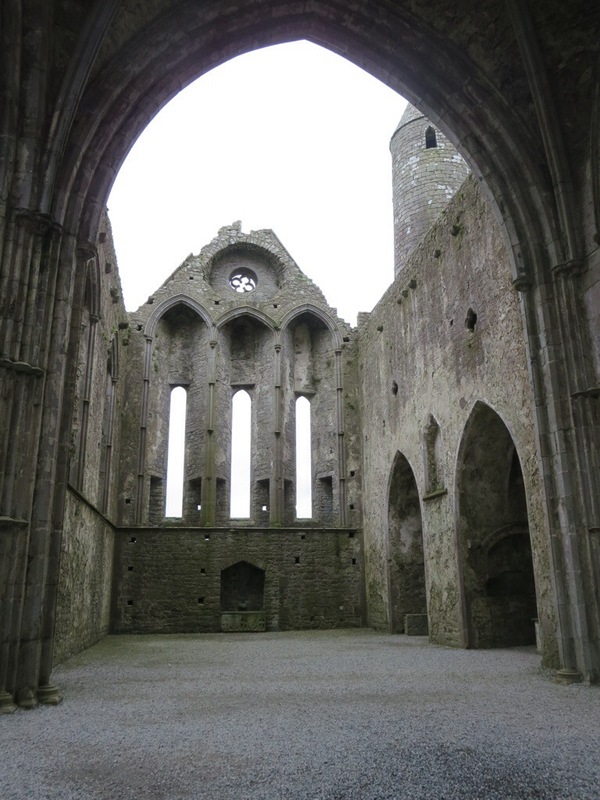 The book stayed in the Abbey of Kells until 1654 when Oliver Cromwell’s army advanced. 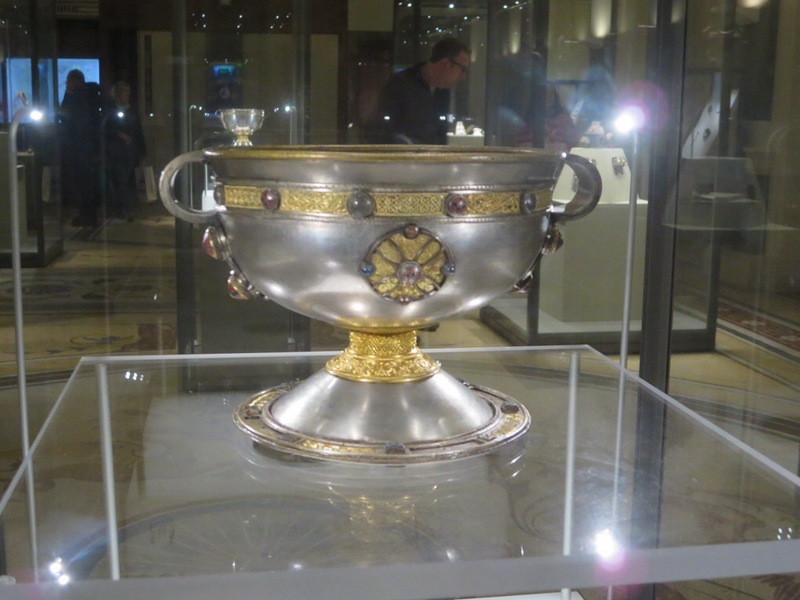 It was then smuggled to Dublin for safekeeping. 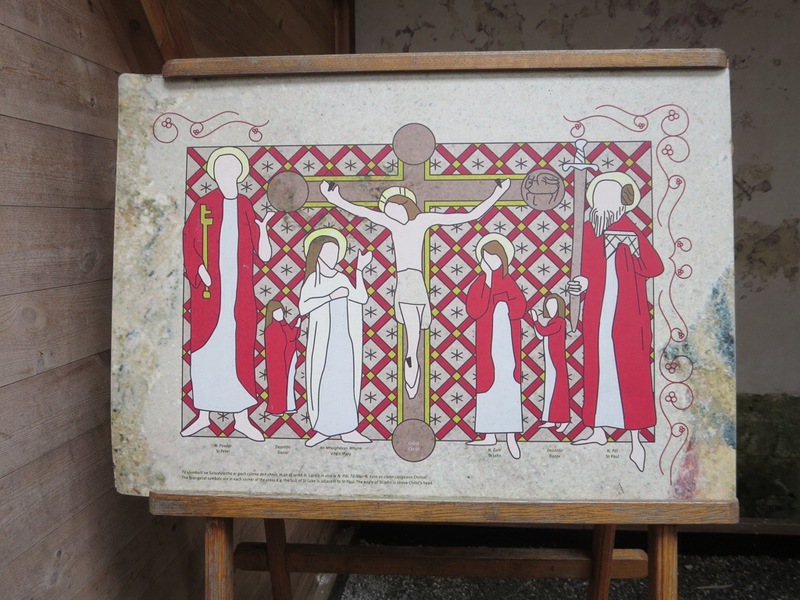 Visitors are able to see two pages on display at a time, and the pages are changed once approximately every three months. 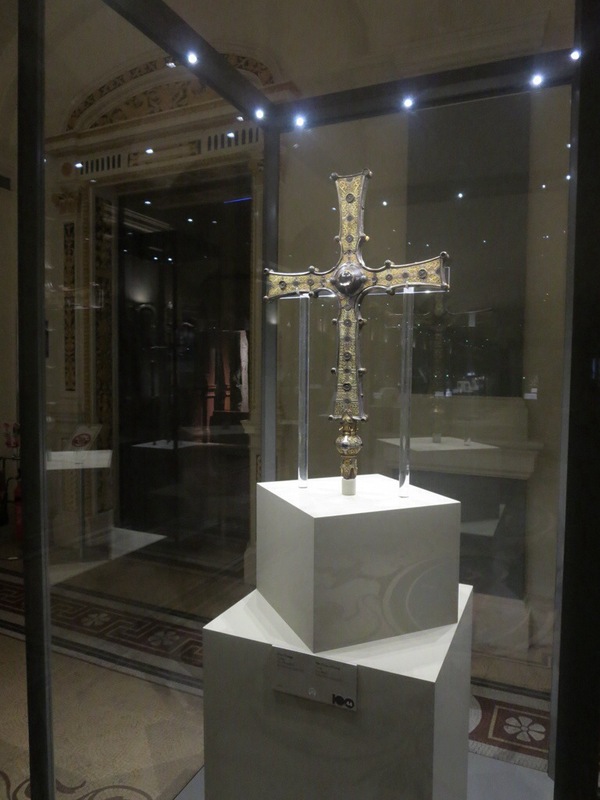 Photos of the book are not allowed, but I can say that the detail and intricacy of the illumination was very impressive. 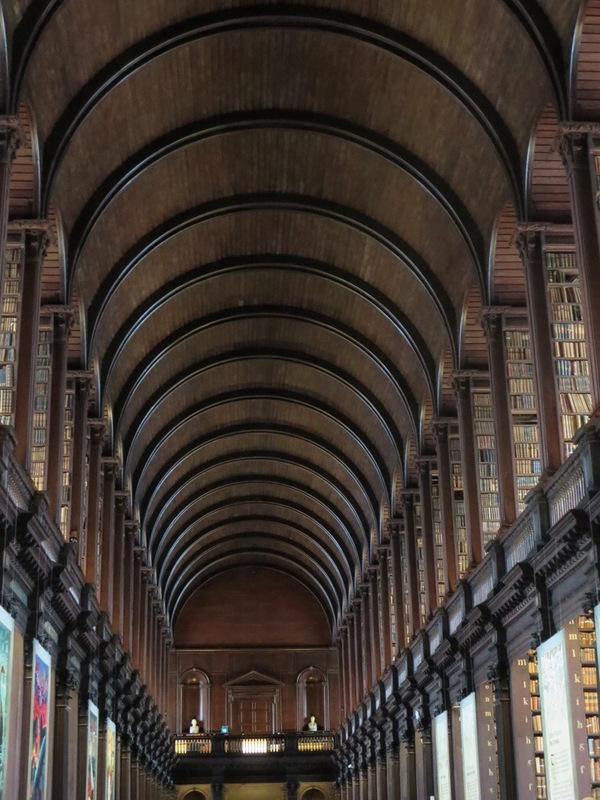 After the Book of Kells exhibit, I went to the Long Room in the library. 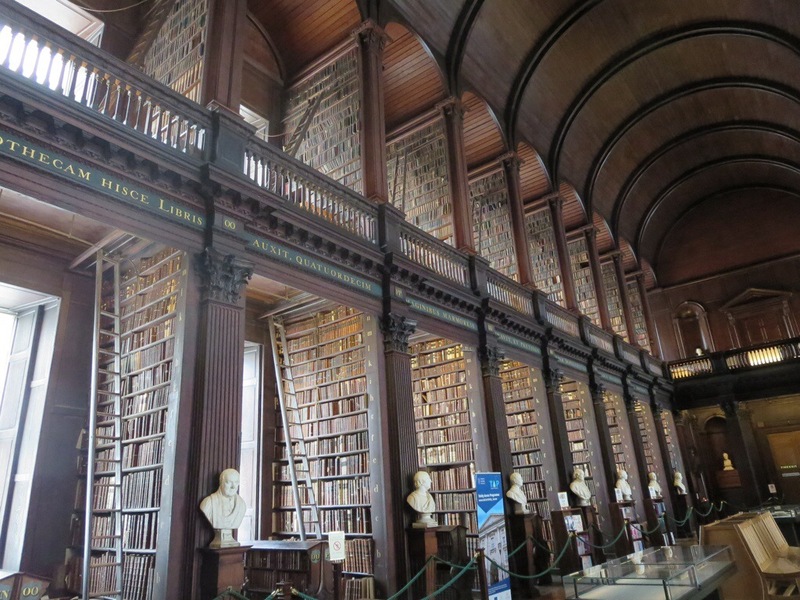 This is the largest library in Ireland which supposedly contains more books than there are people living in Ireland. 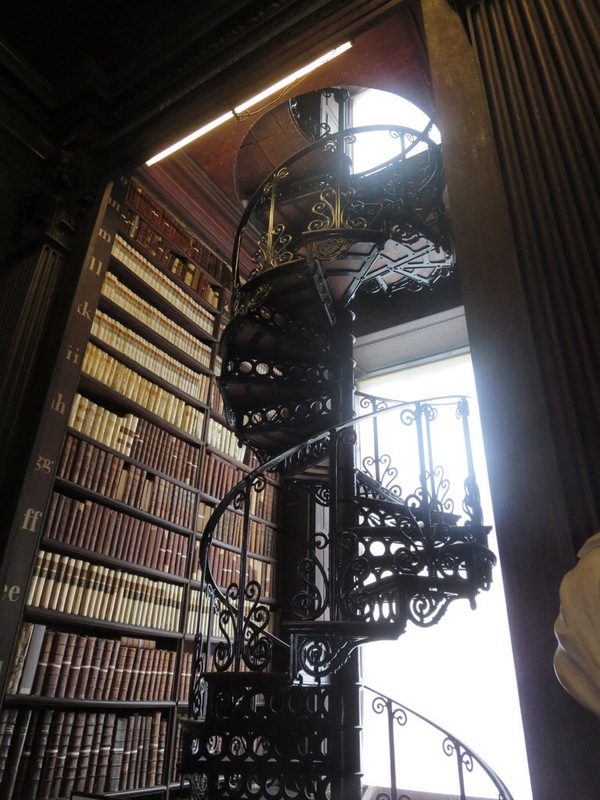 Our guide had told us that the books are arranged by size and color! 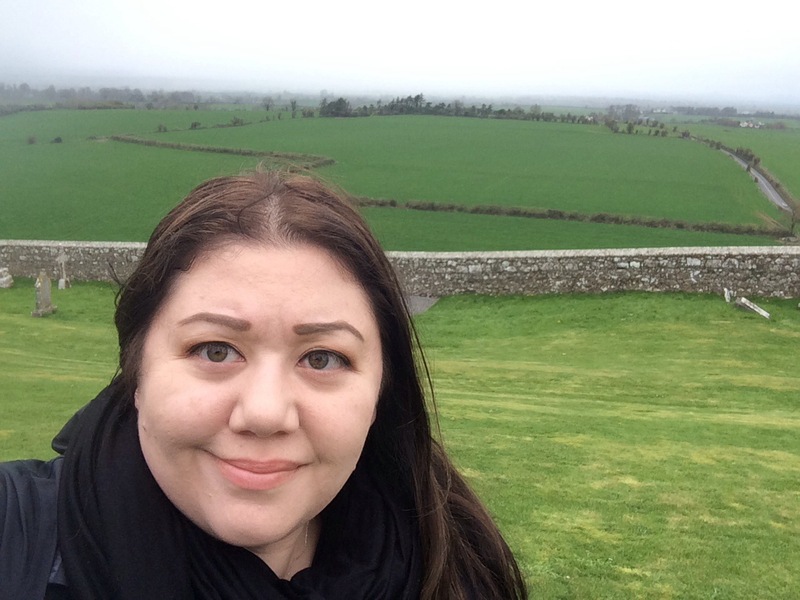 On Friday morning, we made our way back to Dublin. 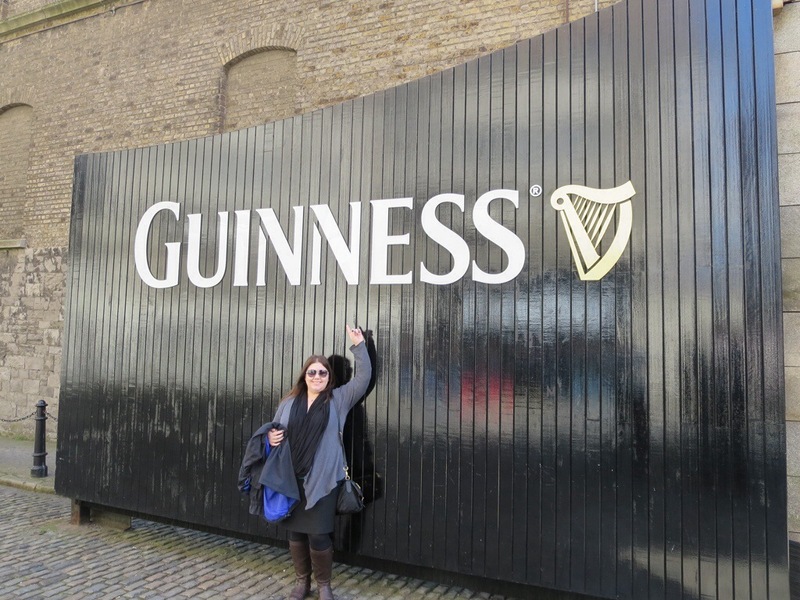 Our first stop was the Guinness Storehouse where we had a guided tour. 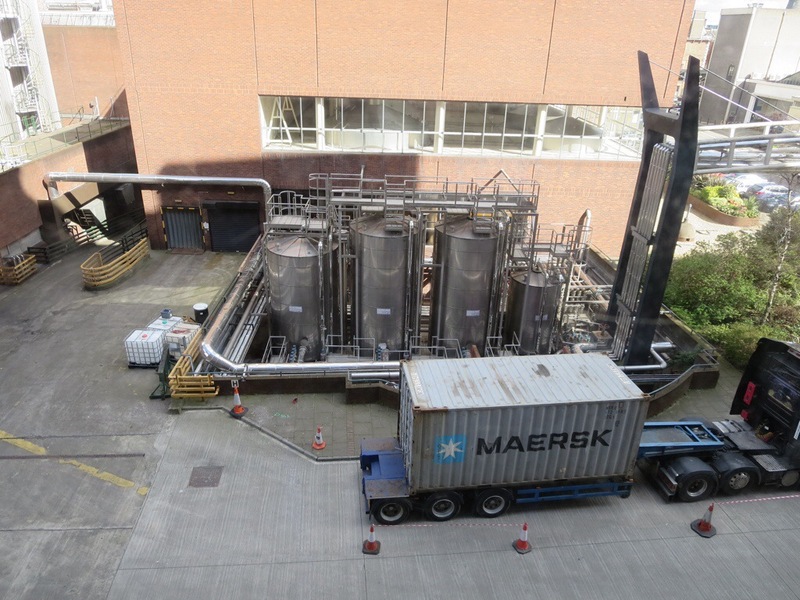 The building is in the shape of a giant pint glass – one that would hold over 14 million pints if it were a real glass! 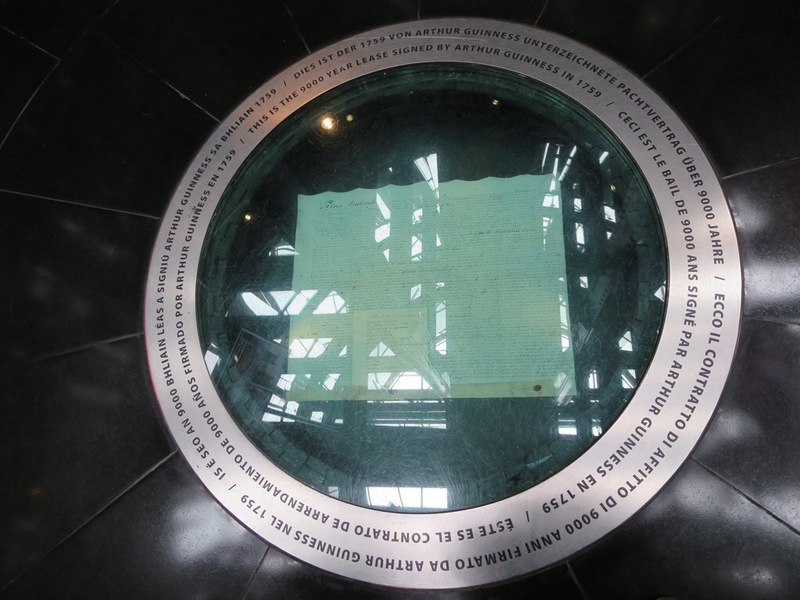 In the floor of the lobby under a panel of glass is the 9,000 year lease that Arthur Guinness signed for the land where the brewery is located. The rate was 45 pounds a year, although the brewery eventually purchased the land, so the lease is no longer valid. Our guide told us about the brewing process and cooperage, the old method of cask making. 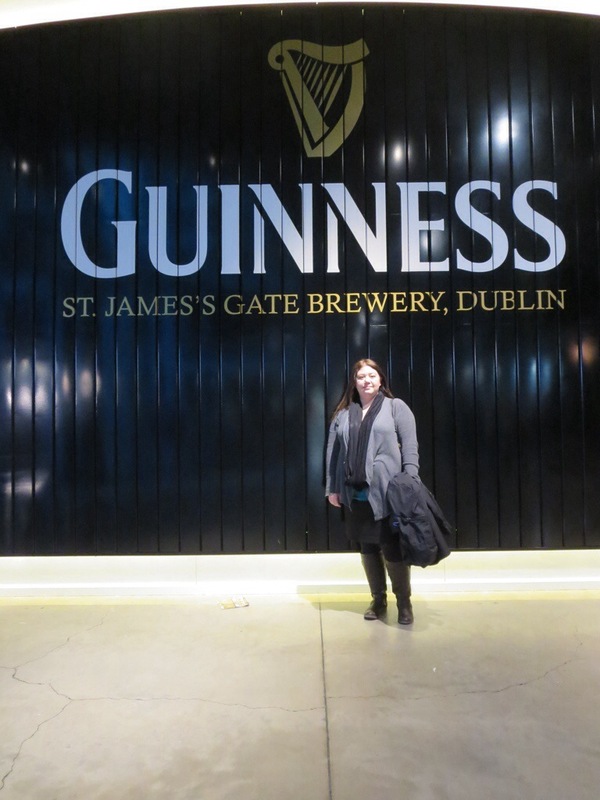 We then saw exhibits on Guinness’ advertising history. 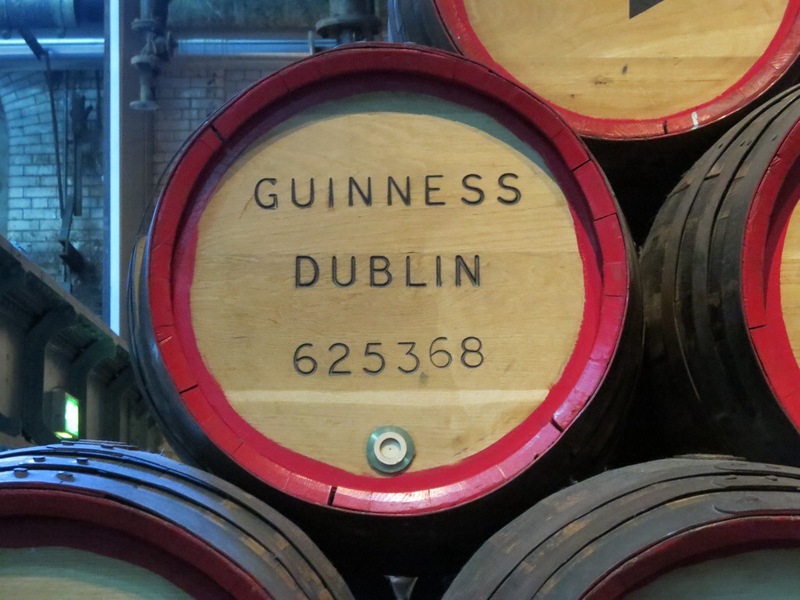 One interesting thing I learned was that Guinness trademarked the harp as its logo. 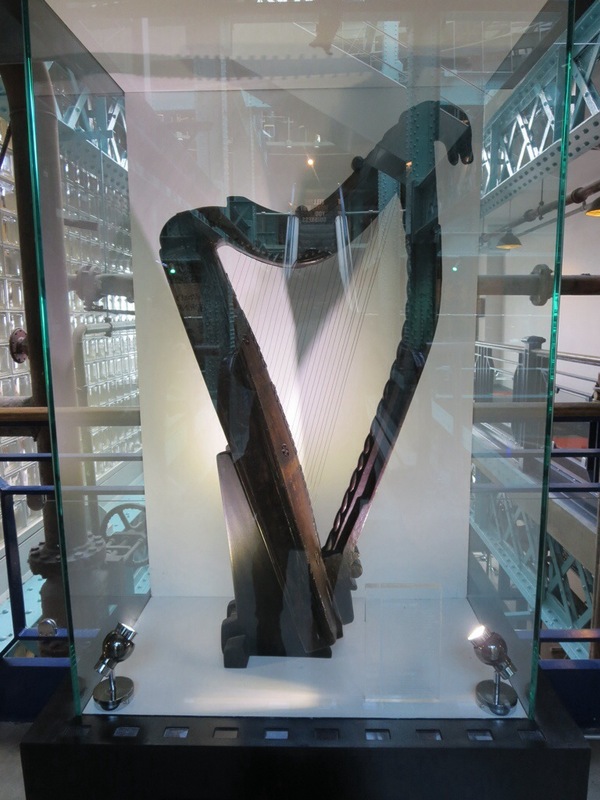 When the Irish government later wanted to use the harp as its symbol, they ran into issues due to the Guinness trademark. 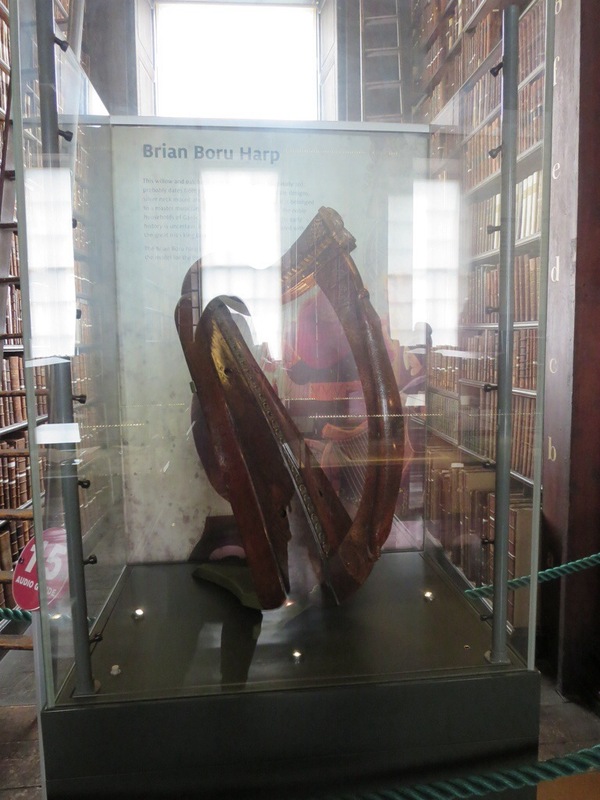 The Irish government got around this by flipping the image of the harp around so that the straight side of the harp is on the right. 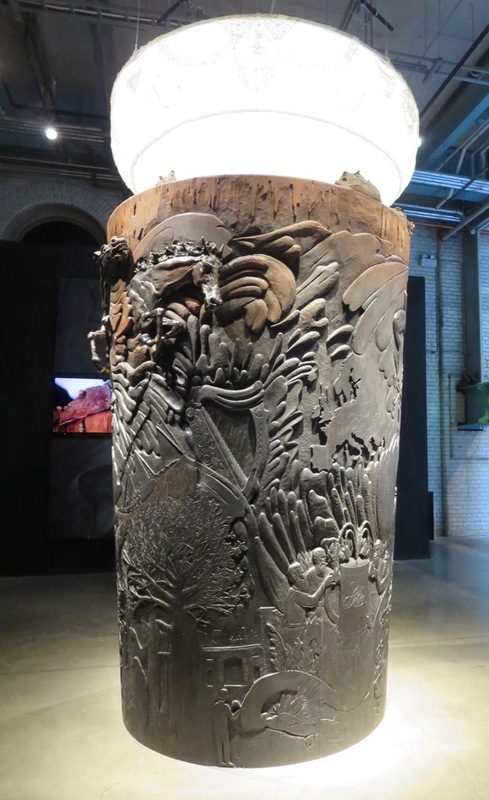 The Guinness harp image has the straight side on the left. 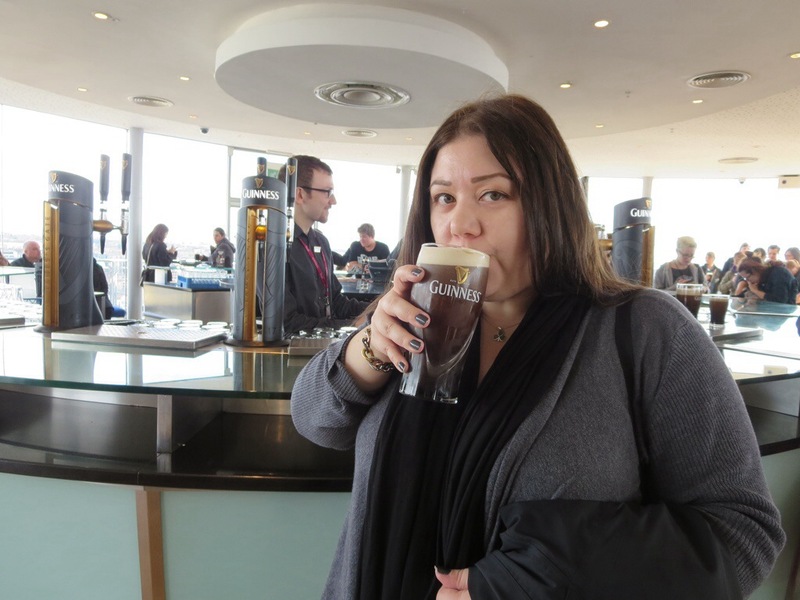 We then proceeded to the Gravity Bar, located on the top floor to have a pint of Guinness which was included with our admission. 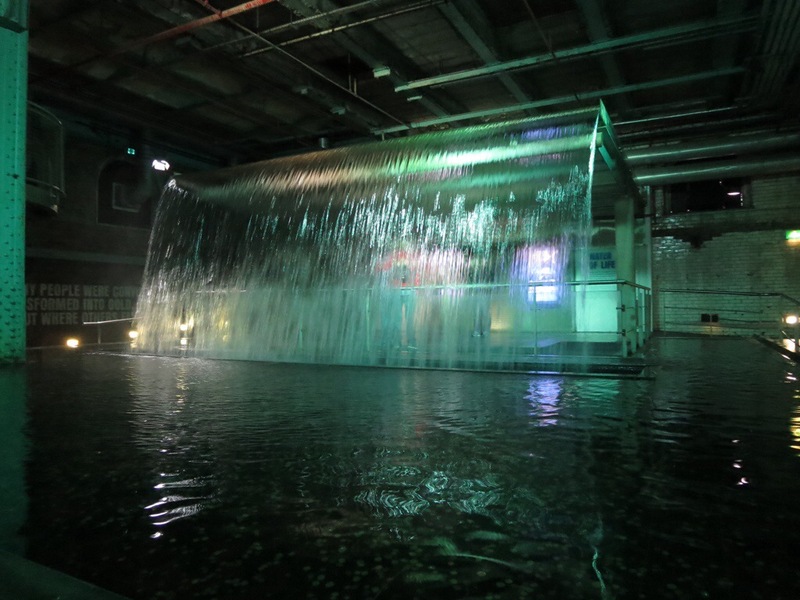 Our guide told us that gravity is a term used by brewmasters to describe the beer’s density relative to that of water. He also told us about the proper six-step process to pouring Guinness. Part of this involves letting the beer settle and then topping it off to the perfect level so that the head is just above the top of the glass but there is no overspill. I am not much of a beer drinker, but I quite enjoyed my pint. 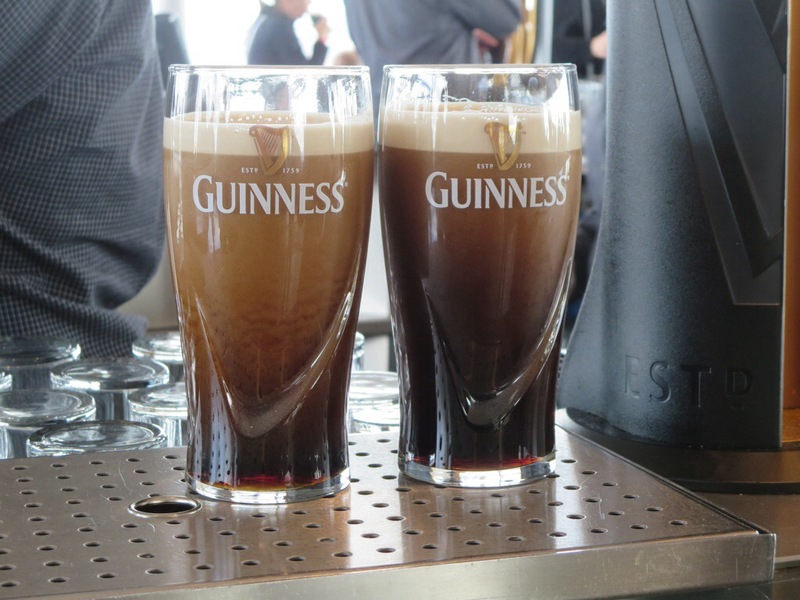 It tasted better from the source compared to other Guinness that I’ve had in the past. 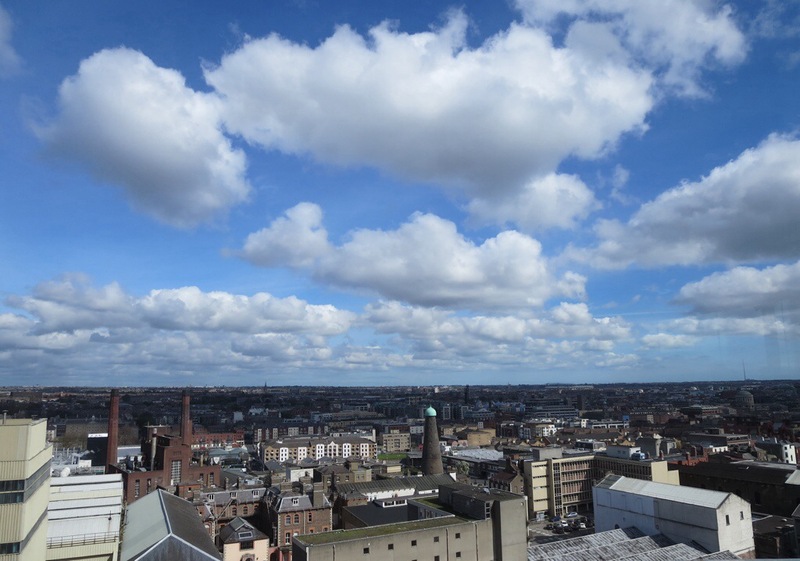 The bar has an impressive 360-degree panoramic view of Dublin. 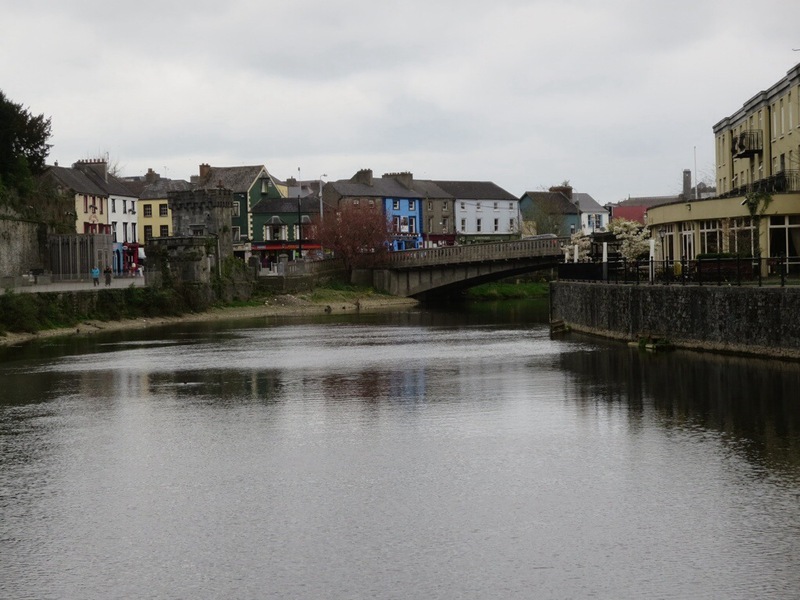 We arrived in the town of Kilkenny on Thursday afternoon. We had some free time before going on a walking tour with a cheeky local guide. 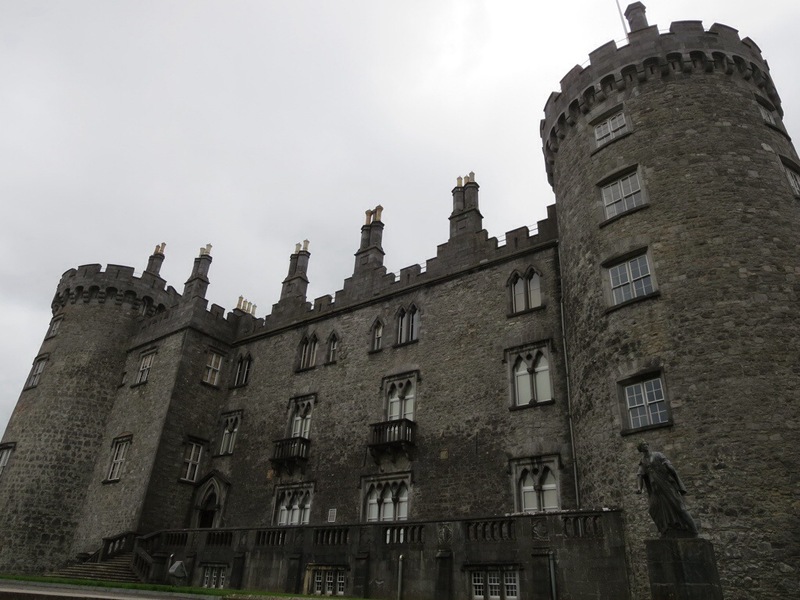 I went for a walk during my free time and checked out the Kilkenny Castle. 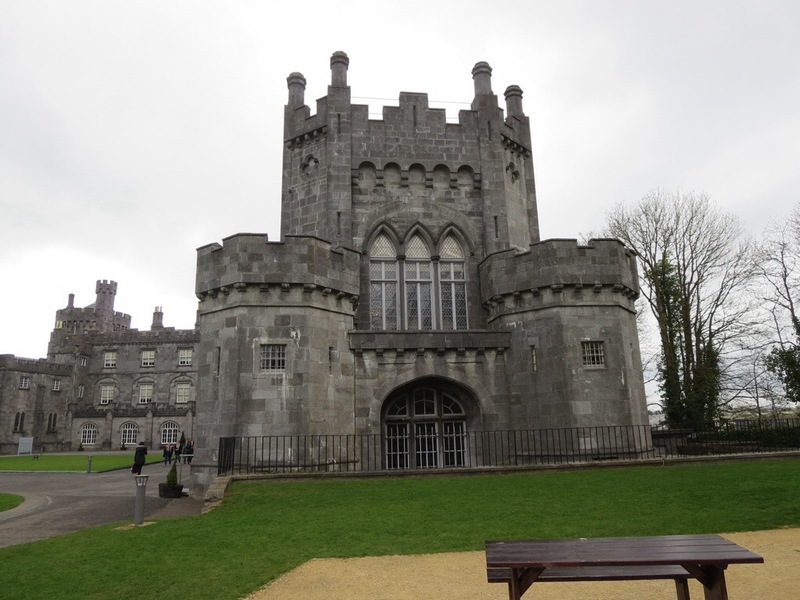 This is where the powerful Butler family who once ruled the area for centuries lived. 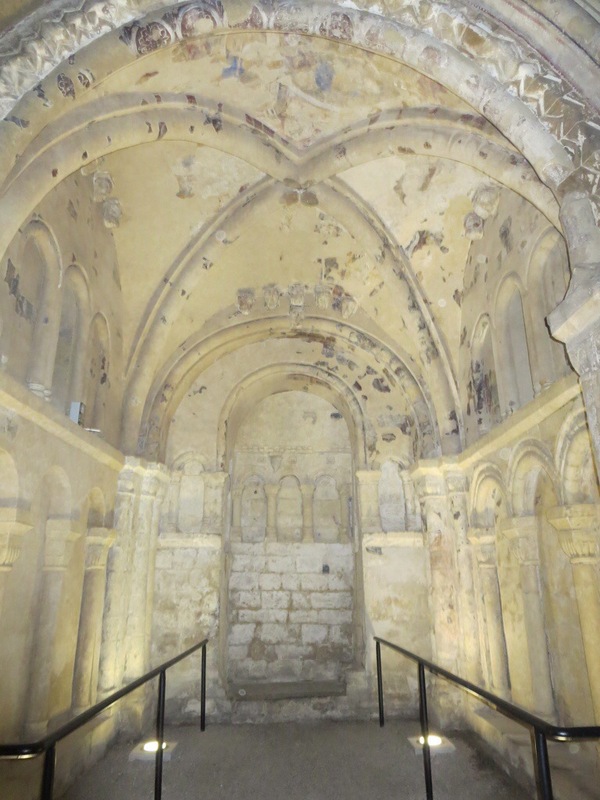 The castle has been here since the 12th century, but has evolved into a 17th-century chateau with a large portrait gallery. 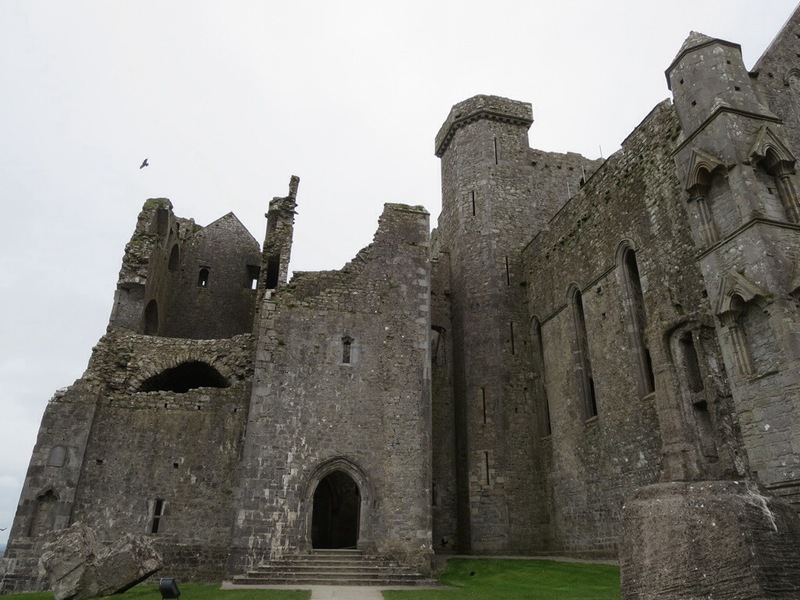 The castle used to have four sides, but Oliver Cromwell’s army knocked down one of the sides, leaving it in a “U” shape. Our local guide took us to 17 High Street, known as the Hole in the Wall which is Kilkenny’s renowned 16th century tavern. 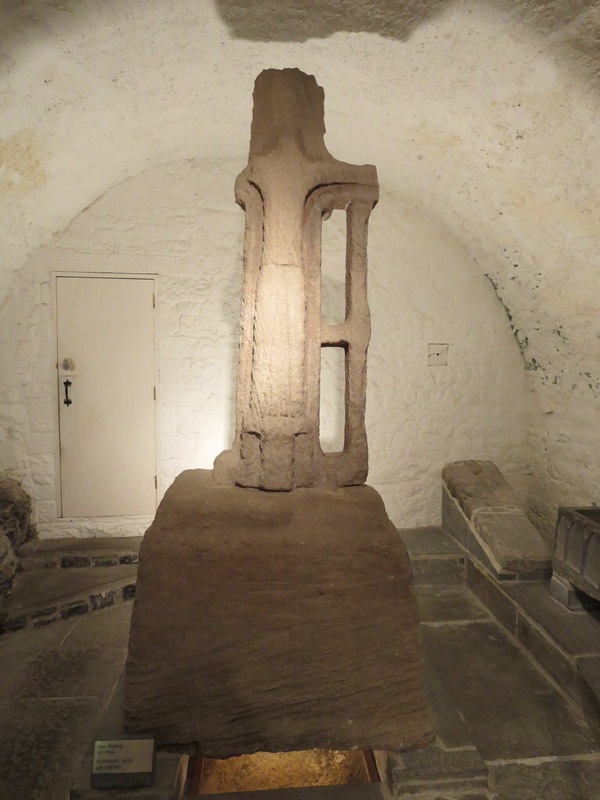 It is housed in the Archer Inner House, which is Ireland’s oldest surviving townhouse. 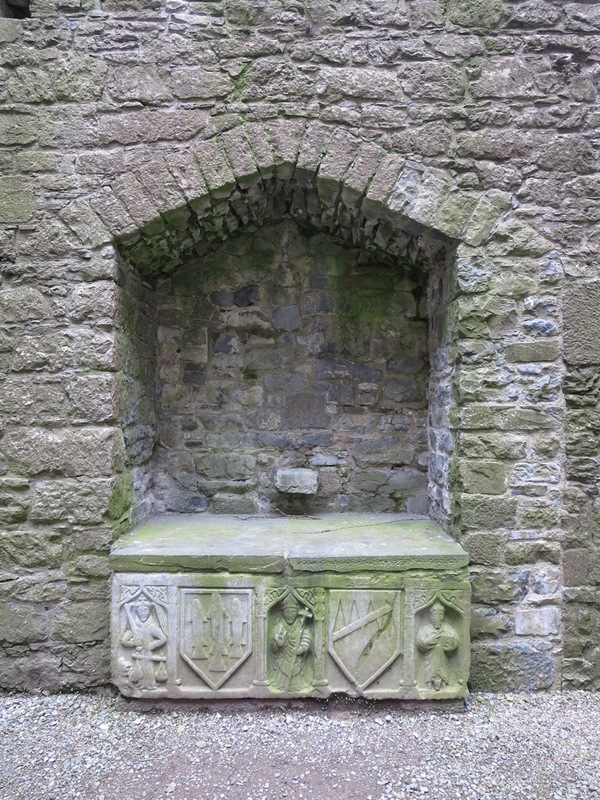 There is a saying about it that goes, “If you ever go to Kilkenny, remember the Hole in the Wall. 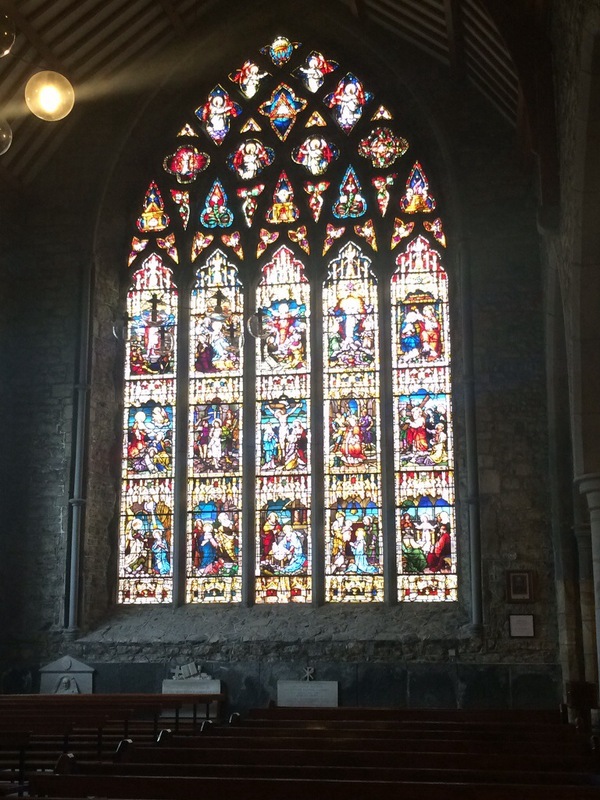 You may there get blind drunk for a penny or tipsy for nothing at all.” We passed by Smithwick’s Brewery, and then visited St. Canice’s Cathedral which dates back to the 13th century. 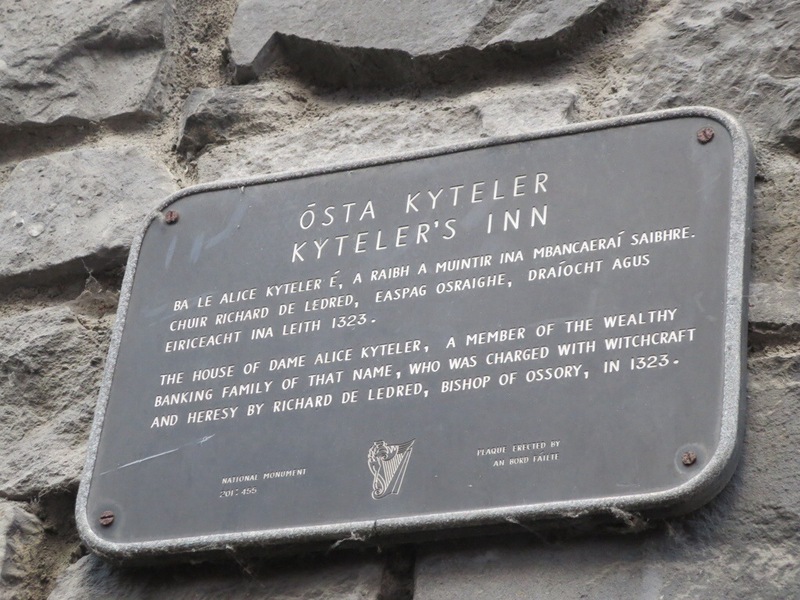 Finally, we stopped inside the cellar of Kyteler’s Inn where our guide told us the story of Alice Kyteler, the first person who was charged and condemned of witchcraft in Ireland. She was a noblewoman who was married four times. 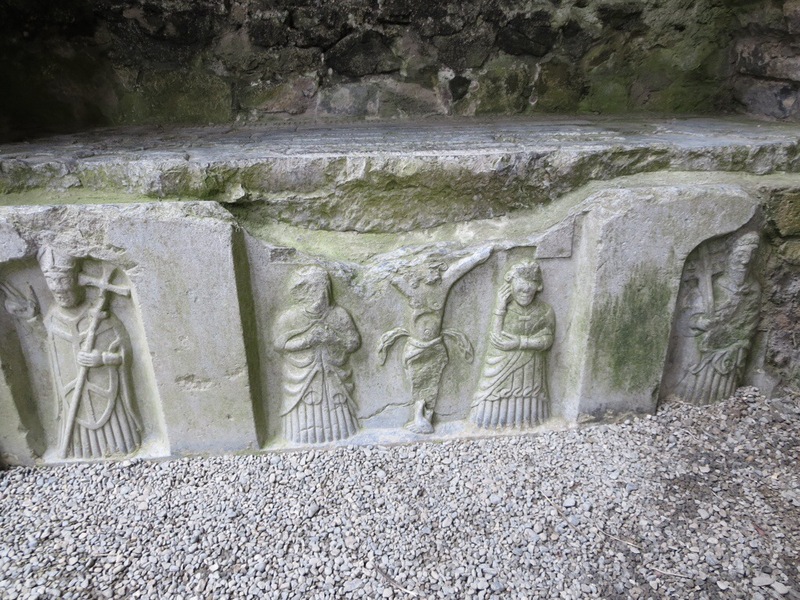 Each of her husbands died before her, and she was accused of using poison and sorcery on her fourth husband. Those who were investigating the charges tortured Alice’s servant until she confessed to witchcraft and implicated Alice. 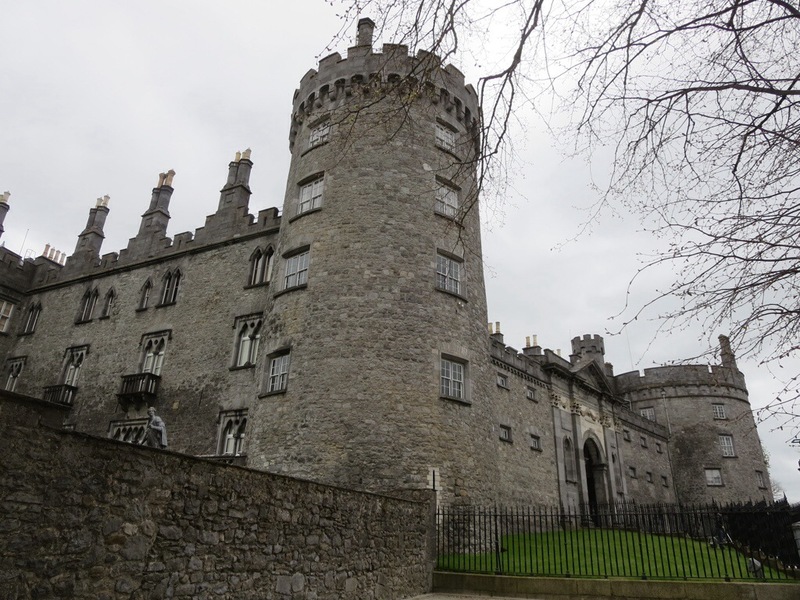 Alice fled the country, probably to England, but her servant was publicly flogged throughout the streets of Kilkenny and then burned at the stake. 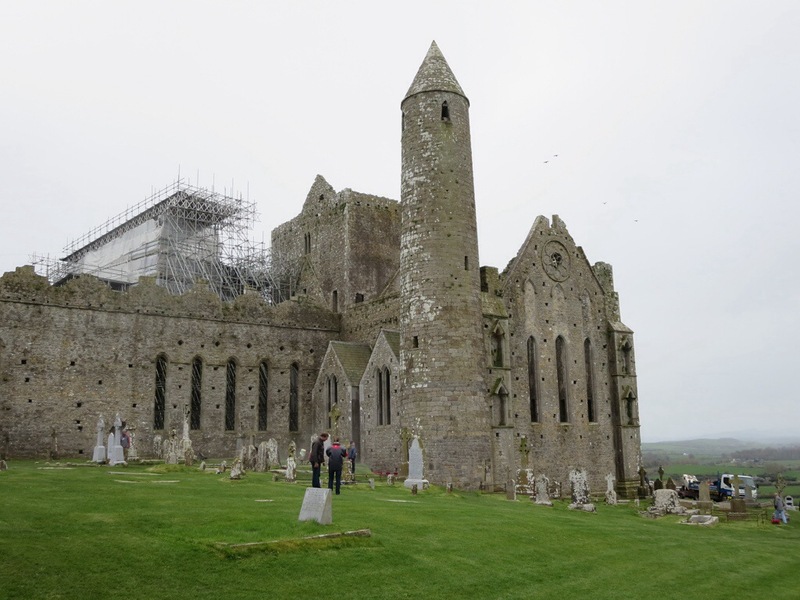 On Thursday afternoon, we visited the Rock of Cashel, one of the most historic sights in Ireland. 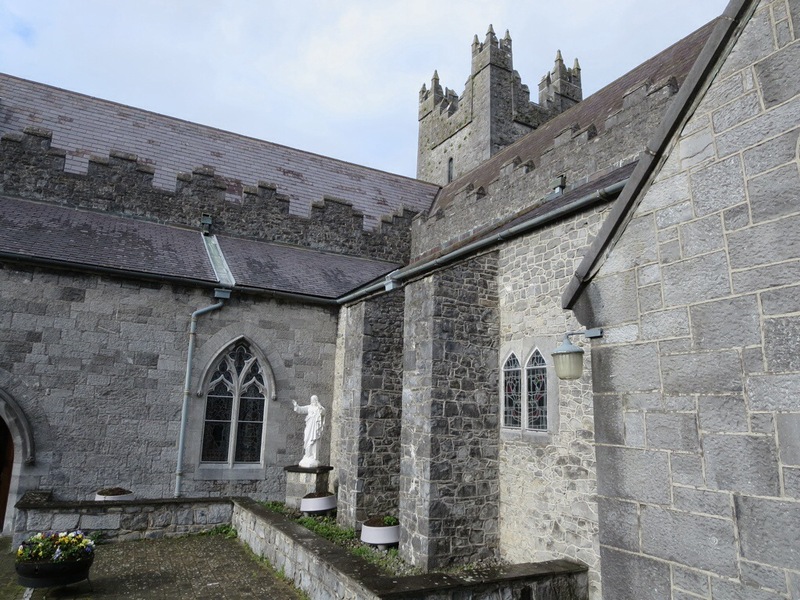 It is famous for being the place where St. Patrick baptized King Aengus in about A.D. 450. An optional guided tour was included with the admission, which I decided to do and got to learn all about the Rock’s storied past. 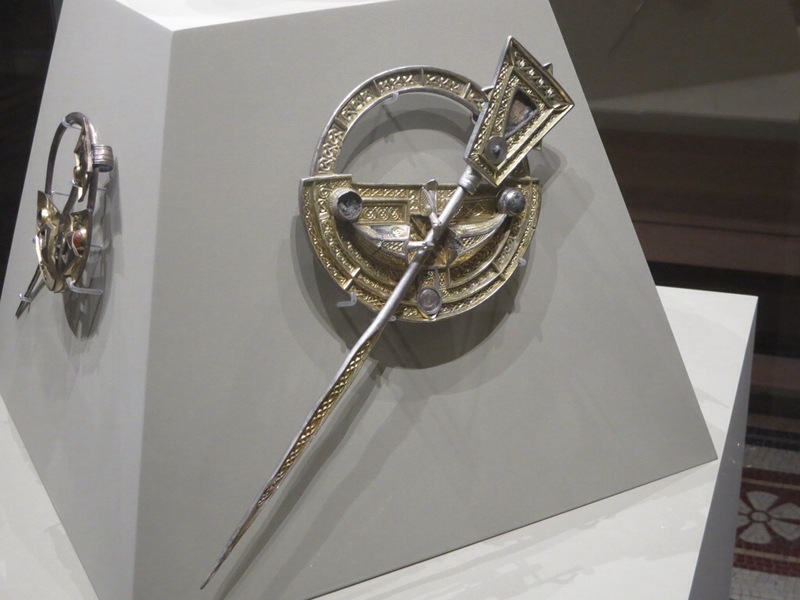 Apparently St. Patrick accidentally speared King Aengus in the foot with his crosier staff while administering the baptismal sacrament, but the pagan king stoically kept silent throughout the remainder of the ceremony, as he thought this was part of the process of becoming a Christian. 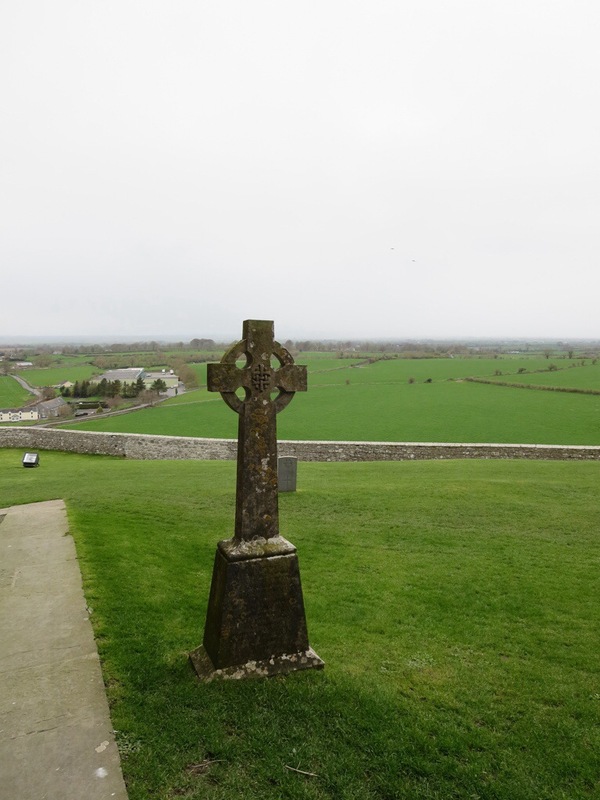 The original St. Patrick’s cross is kept indoors in order to preserve it from weather erosion, but there is a replica outside in its original place. 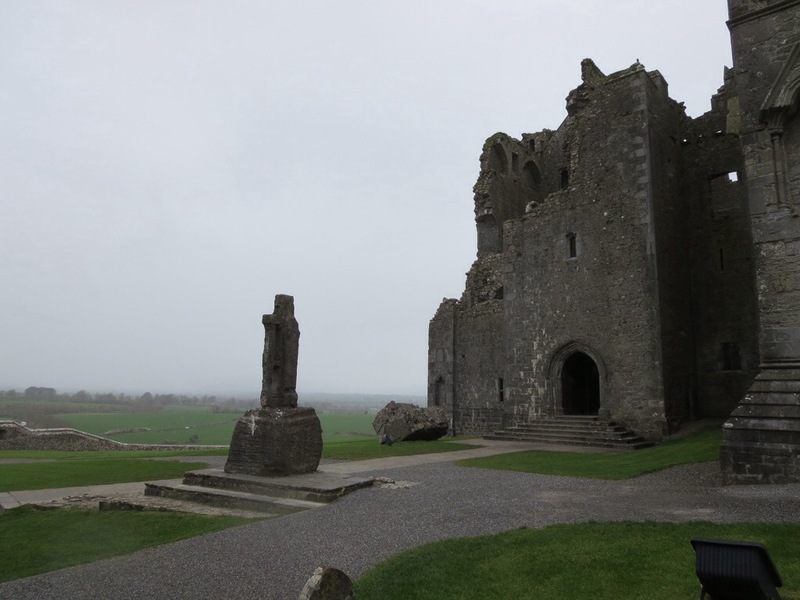 According to the tour guide, this is also the place where Guinness beer was really invented by a man who worked for the Archbishop of Cashel, not by Arthur Guinness in Dublin in 1759 as claimed by the Guinness company. Many of the structures on the Rock have been badly damaged due to weather, the effects of time, or were destroyed by Oliver Cromwell’s army. 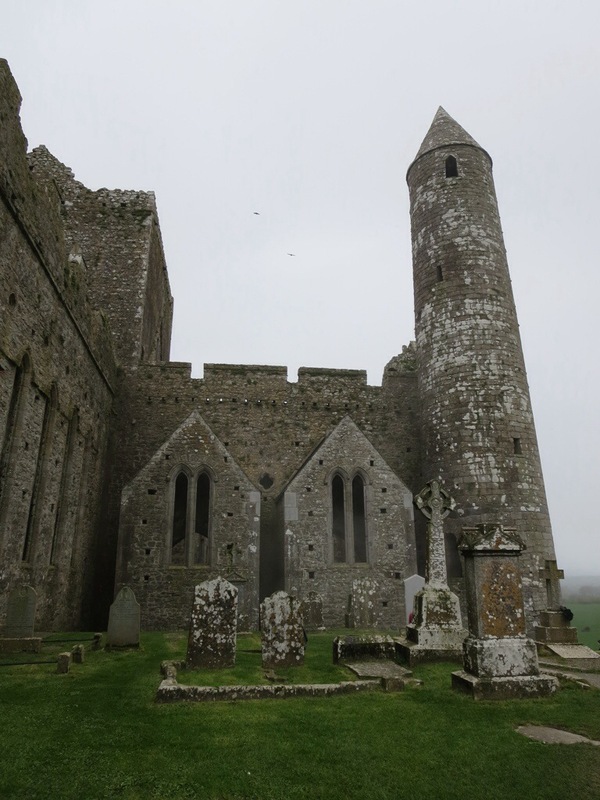 However, the round tower, a type of structure unique to Ireland, is in remarkably good condition. 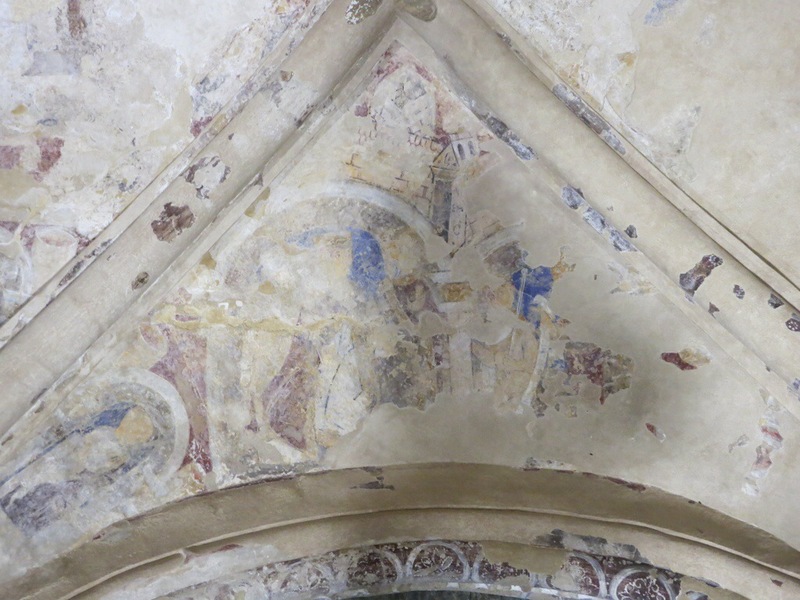 Inside the chapel, there are the remains of frescoes from about 850 years ago. 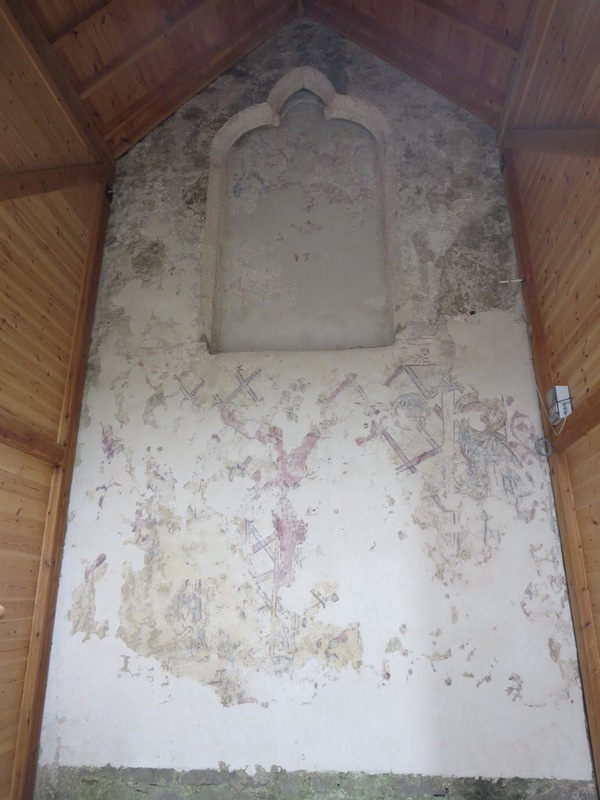 Frescoes are unusual in Ireland due to the climate, and unfortunately, these are in ruins due to them having been whitewashed during the Reformation period. 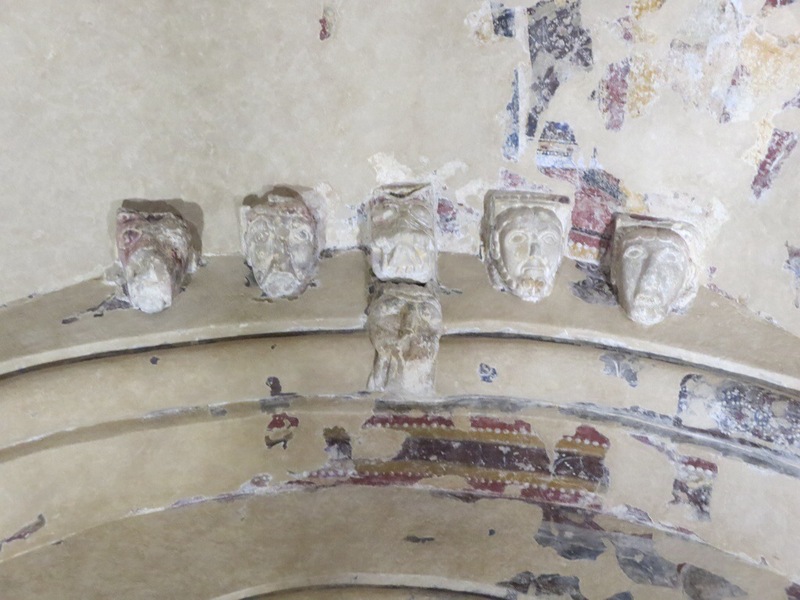 There is also a group of heads above the altar, meant to represent each of the known human races at the time they were made. 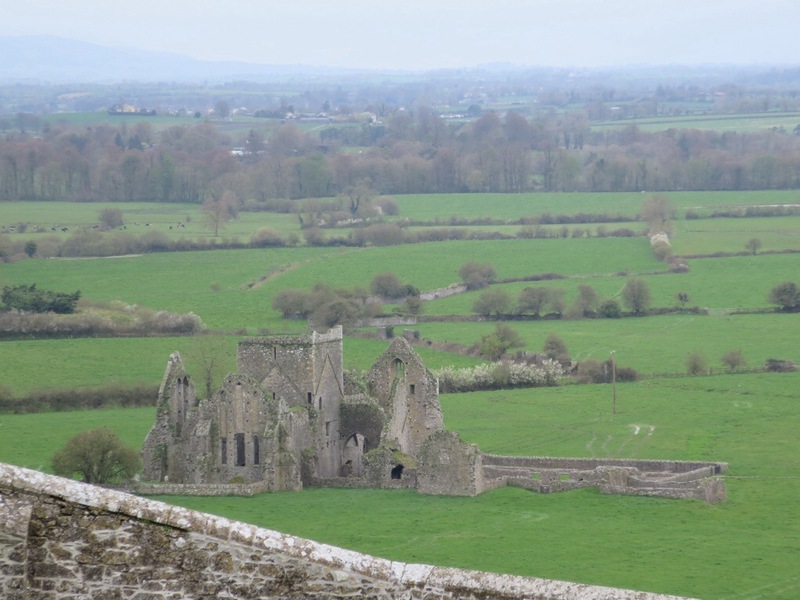 Outside, there is a graveyard full of Celtic crosses overlooking the Plain of Tipperary and the ruins of 13th-century Hore Abbey. 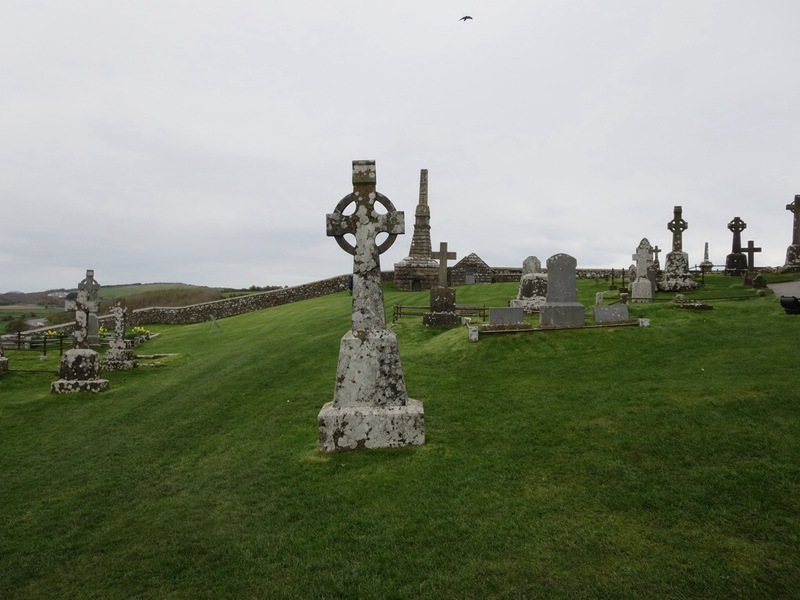 It is considered a great honor to be buried on the Rock, but only a handful of people put on a waiting list in 1930 can still be buried here due to limited space. On Thursday morning, we stopped at Cobh, a town in Cork Harbor. It was known as Cove until 1849. In 1849, the town changed its name to Queenstown to commemorate Queen Victoria’s first visit to Ireland which began in their town. 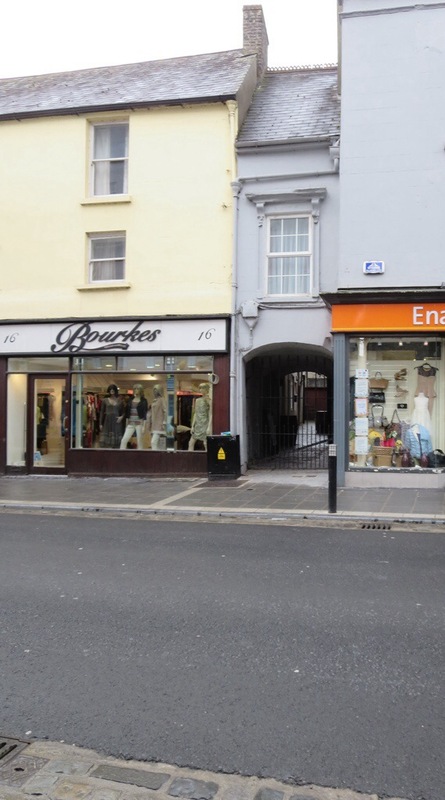 In 1922, the town changed its name to Cobh, which is pronounced the same as its original moniker but is more consistent with the Irish spelling of the word. 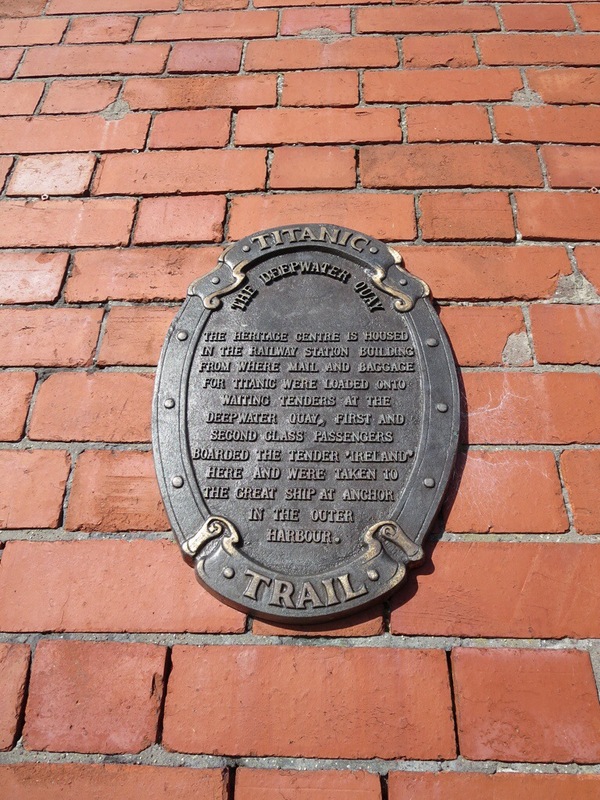 Cobh is well known for being Titanic’s last port of call before it started its fateful voyage across the Atlantic. It is also known as the point of embarkation for many Irish emigrants from the 19th century who settled in the US, Canada, and Australia. 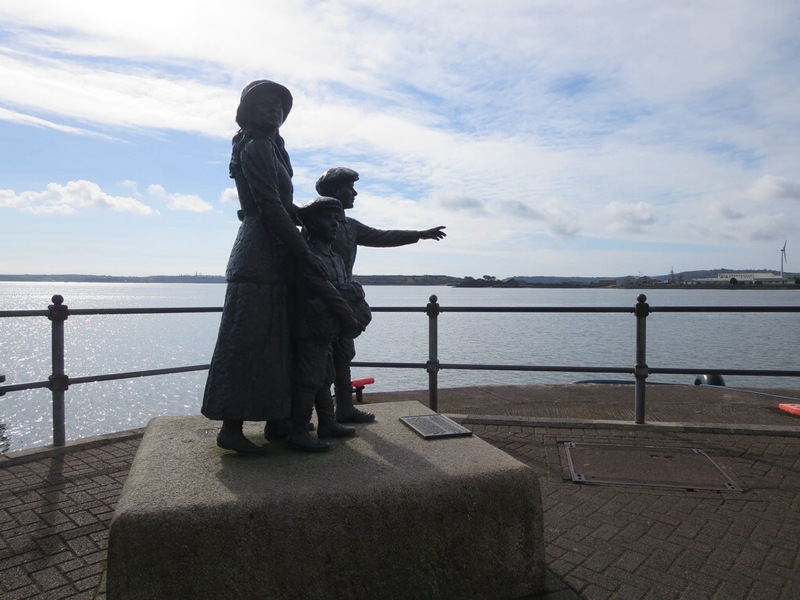 Outside of the Cobh Heritage Center, there is a statue of Annie Moore, the first ever emigrant to be processed in Ellis Island when it officially opened on January 1st, 1892. Annie and her two brothers sailed from Queenstown on the SS Nevada on December 20th, 1891 and arrived in Ellis Island after 12 days of traveling in steerage. 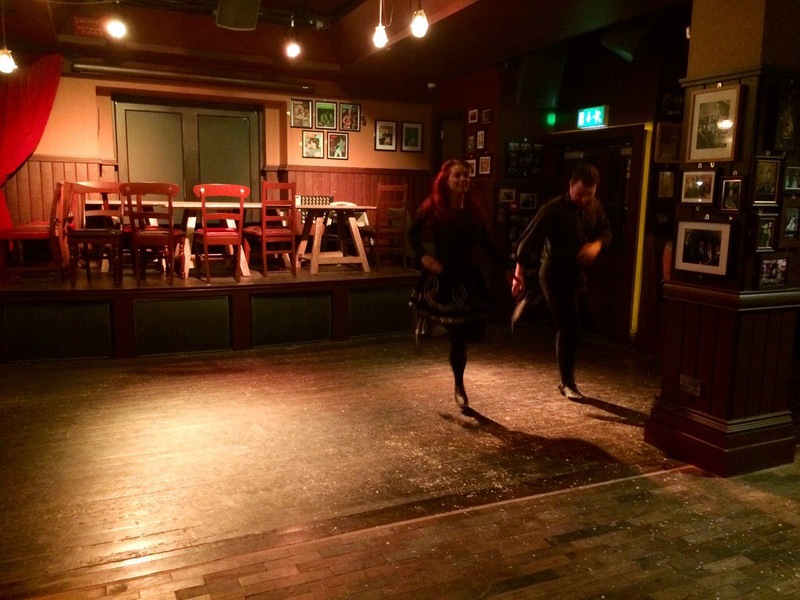 After checking in to our hotel in Cork and having some dinner, we headed over to a pub called Oliver Plunkett’s where we had an Irish dancing lesson upstairs. None of us were that great, but it was still great craic, as they say.